Spring has sprung and I trust everyone has managed their way through the winter months. During my Production Station visits in North and South Taranaki, I’ve seen lots of busy farms thriving with the calving and lambing season. 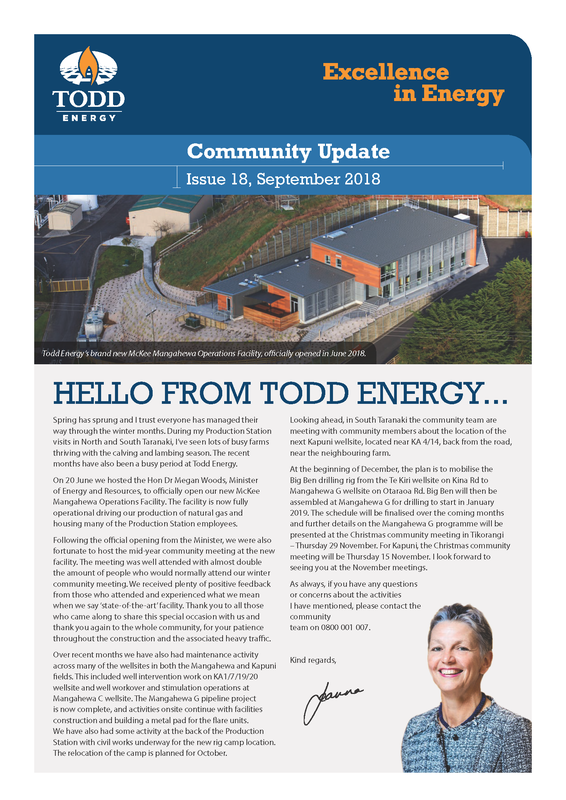 The recent months have also been a busy period at Todd Energy. On 20 June we hosted the Hon Dr Megan Woods, Minister of Energy and Resources, to officially open our new McKee Mangahewa Operations Facility. The facility is now fully operational driving our production of natural gas and housing many of the Production Station employees. Following the official opening from the Minister, we were also fortunate to host the mid-year community meeting at the new facility. The meeting was well attended with almost double the amount of people who would normally attend our winter community meeting. We received plenty of positive feedback from those who attended and experienced what we mean when we say ‘state-of-the-art’ facility. Thank you to all those who came along to share this special occasion with us and thank you again to the whole community, for your patience throughout the construction and the associated heavy traffic. Over recent months we have also had maintenance activity across many of the wellsites in both the Mangahewa and Kapuni fields. This included well intervention work on KA1/7/19/20 wellsite and well workover and stimulation operations at Mangahewa C wellsite. The Mangahewa G pipeline project is now complete, and activities onsite continue with facilities construction and building a metal pad for the flare units. We have also had some activity at the back of the Production Station with civil works underway for the new rig camp location. The relocation of the camp is planned for October. Looking ahead, in South Taranaki the community team are meeting with community members about the location of the next Kapuni wellsite, located near KA 4/14, back from the road, near the neighbouring farm. At the beginning of December, the plan is to mobilise the Big Ben drilling rig from the Te Kiri wellsite on Kina Rd to Mangahewa G wellsite on Otaraoa Rd. Big Ben will then be assembled at Mangahewa G for drilling to start in January 2019. The schedule will be finalised over the coming months and further details on the Mangahewa G programme will be presented at the Christmas community meeting in Tikorangi – Thursday 29 November. For Kapuni, the Christmas community meeting will be Thursday 15 November. I look forward to seeing you at the November meetings. As always, if you have any questions or concerns about the activities I have mentioned, please contact the community team on 0800 001 007.